David Egerdahl is a nutritionist, blogger and writer residing in Colorado Springs. His areas of expertise include, sports nutrition, weight management, and men's nutrition. He graduated from the University of North Dakota with a Bachelor of Science in nutrition and dietetics. Very low-calorie diets, or VLCD, have been used since the 1930s to aid in weight loss. In the most restrictive version of this diet, you consume only five protein shakes a day for a determined period of time under medical supervision. More common is either replacing one or two meals a day with a high-protein, low-carbohydrate shake for five days. The five-day protein shake diet can be an effective way to lose weight, but it has potential side effects. Consult your physician before starting any weight-loss plan. VLCD using liquid meal replacements should be always be medically supervised. There are different products and recipes to help dieters follow the plan. The shakes in these diets are typically low in sugar, carbohydrates and fat while providing 14 to 40 grams of protein in each shake. Typically these shakes provide about 800 calories a day. Some plans will have you add fiber to aid in digestion. Others will ask you to add essential omega-3 fats like flax or fish oil. Most plans will recommend taking a multivitamin with minerals to prevent deficiencies. 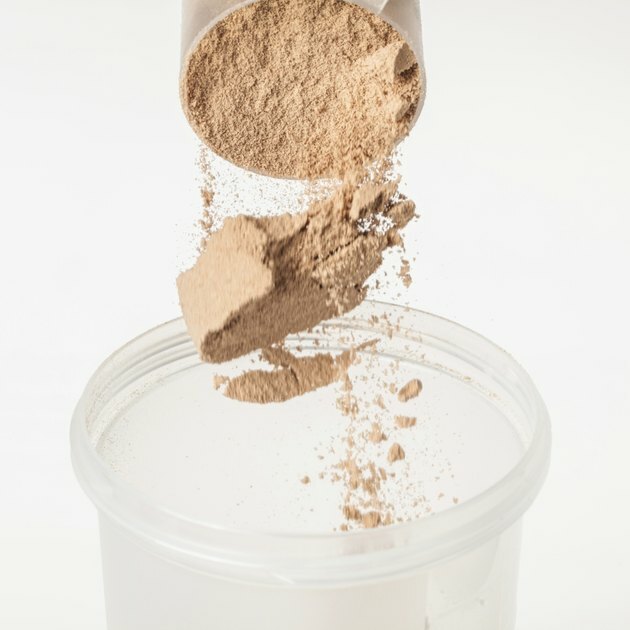 While not a lot of research has been done on five-day protein shake diets, most studies find VLCD using liquid meal replacements very effective. These diet provide anywhere from 600 to 1,400 calories a day depending on the product and plan, giving the dieter the calorie restriction needed for weight loss. The plan takes the dieter away from the “food environment,” allowing him to not think about what foods he should be eating. The plan provides quick weight loss to encourage the dieter’s effort. A 1994 article in the "American Journal of Clinical Nutrition" found a reduced risk of diet/weight-induced liver abnormalities -- which are common in obesity -- with a liquid 800-calorie diet. This plan is extreme and requires a high level of motivation. While the plan is effective, it has a high potential for misuse, and it should not be seen as a long-term solution. High-protein diets have been shown to be more satisfying than other types of diets. However, liquid diets have been found to be less satisfying. The diet should be avoided if a person has digestive disorders like Crohn’s, diverticular disease, ulcerative colitis or diseases that involve protein excretion and metabolism like kidney or liver disease. Potential side effects of the diet include symptoms associated with nutrient deficiencies, abnormalities of the heart and cognitive dysfunction. If you choose the five-day protein shake diet, plan to transition to a regular, balanced diet that is lower in calories for continued weight loss. Remember, not all protein shakes are created equal. Some will be higher in sugar, others may not have adequate protein and still others may not be fortified with all the essential nutrients you need. Is Isopure a Good Protein?